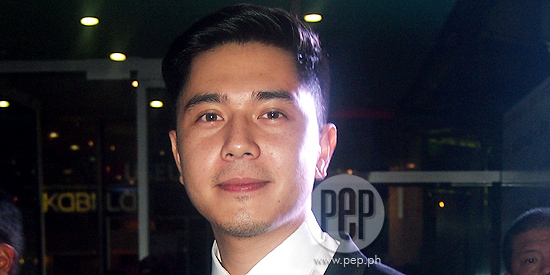 Prior to becoming the Gawad Urian-winning actor he is today, Paulo Avelino proved his talent in the 2011 Cinemalaya Philippine Independent Film Festival entry, Ang Sayaw ng Dalawang Kaliwang Paa. The film, which explored poetry and dance, allowed Paulo, cast alongside Rocco Nacino and Jean Garcia, to exhibit his subtle but stirring acting. This skill Paulo went on to develop in the 2012 primetime hit, Walang Hanggan, where the 24-year-old actor played the dark character of Nathan Montenegro. In this year’s Cinemalaya season, Paulo stars in two film entries— Jerrold Tarog’s Sana Dati (Directors Showcase) and Alvin Yapan’s Debosyon (New Breed). In a brief chat with PEP.ph (Philippine Entertainment Portal) last Thursday, July 25, Paulo laughed off liking one of the films more than the other. “Itong dalawang pelikula namang ito, ginawa ko nang hindi labag sa loob ko. The actor admitted that shooting both films was a great and gratifying experience considering he has previously worked with both the directors and their respective production teams before. Paulo starred in Jerrold Tarog’s mainstream thriller film, Aswang (2011). Meanwhile, Ang Sayaw ng Dalawang Kaliwang Paa was directed by Alvin Yapan. “Enjoy gawin yung dalawang pelikula dahil ang dami kong natututunan sa kanila,” said the actor. Paulo remarked that Sana Dati is “not your typical love story” and a must-see because it completes the director’s “Camera Trilogy,” the precedent indie films being Confessional (Cinema One 2010) and Mangatyanan (Cinemalaya 2009). Elements in the two previous films were incorporated in Sana Dati, according to Paulo, making the romantic drama a treat for any Jerrold Tarog fan. Alvin Yapan, meanwhile, explores religion and love as it features Paulo as an Our Lady of Peñafrancia devotee in Debosyon. Mando, Paulo’s character, will realize that “Faith is love” as the film’s tagline goes. According to Paulo, Debosyon is made remarkable by the fact that it was shot in Naga and that he and co-actor Mara Yokohama had to learn and speak Rinconada Bicol—an ancient Bicolano language—in the film. Grasping the language was difficult, said Paulo. He recalled, “They sent us an audio file of the lines in Bicolano language. “Pag dating dun, our coach is very strict also. Very particular siya sa pronunciation. “Before we started filming, nakuha ko yung audio file, three weeks before. While the chance is high, considering he has two entries this year, the actor capped off the interview, “Ang akin lang kasi ang gusto ko para sa dalawang pelikulang ito ay maraming makanood as much as possible. ALMOST REPLACED IN DEBOSYON. In a separate interview with Alemberg Ang, the producer of Debosyon, and Direk Alvin Yapan, they revealed that they almost replaced Paulo since the ABS-CBN actor had a very hectic schedule. At that time, Paulo was still shooting for the now defunct primetime series Walang Hanggan. “He actually cancelled skeds [for this project],” admitted Alemberg during the July 26 press conference hosted by Debosyon co-producer Atty. Joji Alonso at Victorino's restaurant at 11th Jamboree Street corner Scout Rallos in Quezon City. Direk Alvin also mentioned that when Paulo read the script, he insisted that he audition for the role of Mando, a farmer who is a devotee of Our Lady of Peñafrancia. His character becomes so enamored with Saling (played by Mara Lopez) that he prays for a miracle from Ina (as Our Lady of Peñafrancia) is called. The producer and the director admitted that they initially had hesitations about casting Paulo as a farmer. “Noong una, ayaw namin kasi hindi siya mukhang magsasaka,” said Alem. Aside from this, Direk Alvin also revealed that Paulo personally drove his own vehicle to go to the set location in Bicol. Paulo brought someone to act as his alternate driver as he embarked on the 8-hour drive going to Bicol. PHYSICAL CHALLENGES. The lead actor also endured acting under the heat of the sun as they shot the procession scene and the scene involving his fall from a tree. 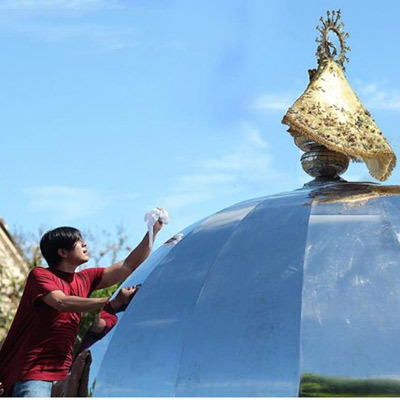 Direk Alvin recalled: “To prevent people from climbing up, may dome na nagpo-protect kay Ina. Grabe ang shoot na yun! Sobrang kailangan mo yung energy ng crowd…Nag start kami ng 10 am then nung 12 noon na, tinanong ko, mag lunch break na ba tayo? Another difficult scene to shoot involved Paulo’s fall from a tree wherein he did not use a stuntman. Alem gestured with his hands, “Kung nandito ang branch ni Paulo, yung cameraman, nandito [indicating a much higher level. Pero nung nakatungtong na lahat, sabi ng stunt coordinator, parang mahina yung kahoy. Alem pointed out: “At siya ang nagre-request ng more takes. Pag pangit yung bagsak, pag mukhang fake, siya pa ang nagre-request na ulitin namin.